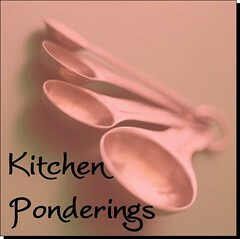 Pondered in my Heart: You Won't Mind, Will You? If I give you just a little more tour? 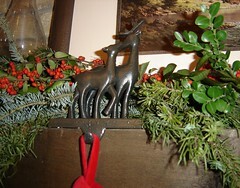 I finally recharged my batteries and took a few more pictures of some of my favorite Christmas treasures! 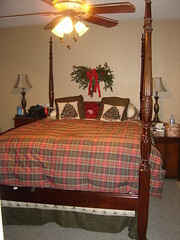 Here are the Christmas bed linens I didn't have a picture of yesterday. Actually, we use that comforter all fall and winter, switching to a lightweight quilt the rest of the year. I just added Christmas pillows! 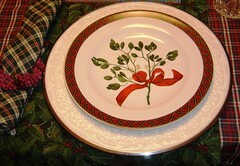 These are our Christmas dishes (the salad plates) on top of our wedding china. 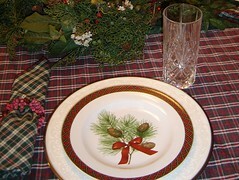 The Christmas dishes feature 4 different types of Christmas greenery. 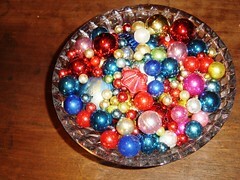 A crystal trifle dish filled with vintage ornaments adds some sparkle to the coffee table. 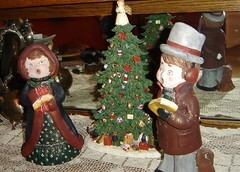 Most of these ornaments were picked up at yard sales for pennies. Some came from my husband's grandma. 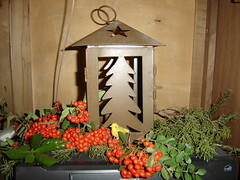 Mixed greenery and berries collected from roadsides and friends' yards deck our mantle and other spots about the house. Don't you love the radio antenna wire accent? 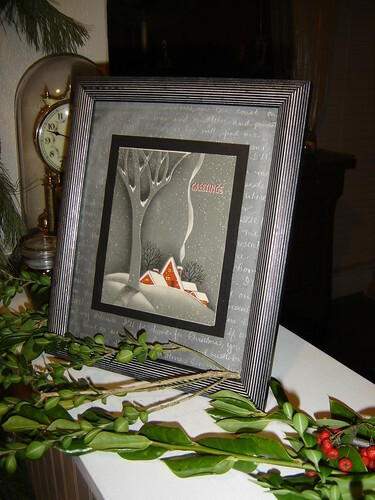 Here's a framed vintage Christmas card. I used pastels to color a background on art paper and applied fixative, then wrote the lyrics to "I'll Be Home for Christmas" with silver pen. Mounted the Christmas card on my "matte", then framed. Isn't that a sweet little cabin? Finally, here a few cookie recipes waiting in my kitchen for my baking marathon tonight...we are having a cookie exchange tomorrow! 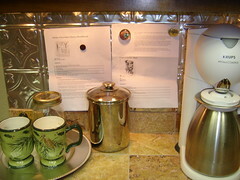 We just finished remodeling our kitchen a few months ago, and I was so tickled last night to discover that I could use magnets on the backsplash to hold up my recipes as I mix them! Thanks for coming back for more (you glutton, you!). Speaking of gluttons, I'll post my cookie exchange recipes after I've tested them. Stay tuned! I like some of your ideas, and oohhh those are pretty dishes. Your house definitely looks ready for Christmas!